We date because we can, instead of because we are called. Believe it or don’t: that’s one of the myriad of reasons we have divorce. Have you considered your motivation for dating? In our beloved discussion series, Friends Don’t Let Friends Date Dumb, we share the TOP10 Dumbest Reasons to Date. It outlines common motivations that lead to dating disappointment and heartbreak. You can check out all ten at the link above, but the first is this: we date just because we can. Many of us start dating as soon as we can, which is predominately contingent on the presence of a willing partner and, if we’re young enough, parental permission. But just because you can doesn’t mean you should. How different would our relationship life be if we dated because we were called? I don’t mean, because someone called you and asked you out. I mean, what if we dated because we sensed a calling to pursue a relationship where we would partner with another human being in a life-giving, life-long marriage? No, I don’t mean we wait until we know someone is the person we will marry before we date them (although, many love birds believe they’re sure of it from day one). The idea is that we date only once we know we are ready to start pursuing marriage as a life goal. Then dating becomes part of the process by which we discern God’s will. Date because you’re called, because the reality is, unless you’re called to celibacy, you are called to marriage! And the best kept secret in relationships: marriage is an awesome calling! But most of us don’t date out of a sense of calling. And then we don’t marry out of a confirmed calling. Marriage isn’t something to fear or avoid. It’s not something to fantasize about or idolized. It’s not something to slide into or settled for. It’s an awesome calling to prepare for. And if dating is part of the process of discerning that calling, then you want to start preparing for marriage before dating. Otherwise, how can you date intelligently and wisely? But in our culture we figure it out as we go along. Imagine if we did that with our career: no preparation, no guidance counselors, no input from family and friends who know us and love us best. No college, no major, no direction. Just start dating. I mean, interviewing. When you date because you are called, it gives your dating life a sense of purpose and mission! We date like it’s a board game with nothing but play money at stake. We date like it’s just another way to pass the time instead of a way to find a treasure. We date because we need to find love instead of because we want to share love. 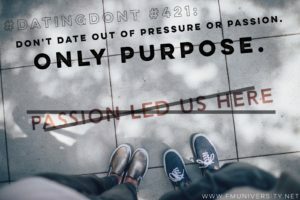 We date out of pressure, or passion, instead of purpose. We date to find meaning instead of a mate. We date wondering if the love will last, never realizing true love can never be lost. Which is to say we date without even understanding what true love is. We date people to whom we’re physically attracted, ignoring people to whom we’d be well matched. We date like it’s a child’s game where you can just start over when things aren’t going your way. We date to end our loneliness instead of simply enjoy companionship. We date because everyone else seems to be, as if everyone else seemed to be succeeding in relationships. We date, but act like we’re not. Then we behave similarly in marriage. We date first. Then ask questions later. We date hoping to ensure our happiness, instead of enter a holy union. We date to fill our emptiness, instead of fulfill our destiny. Where do you want to wind up? What destination do you want your dating life to take you? Can you see how a sense of calling to marriage, empowers you to date with passion and purpose? Take some time this week to discuss these ideas with friends who know and love you well. And let us know your thoughts. Better yet, check out our Purpose-Driven Dating series on YouTube. For the next post in our Dating 101 series click here.